Five Unexpected Places To Visit In The U.S.
I’ve recently started blogging for The Virtual Campground, a wonderful community of RVers and aspiring RVers with a sense of humor, fun and compassion throughout. I’m honored to be sharing my thoughts over there, and it’s challenged me to up my blogging game with new topics for a new audience. My first effort there covers five of my favorite unexpected places that we’ve discovered in our travels. Let me know what you think! Make other purchases using our affiliate links. Capital One 360 is one everyone can take advantage of to save money! Signing up with Dosh is a great way for everyone with a smartphone to support us, and we also have options for aspiring virtual assistants as well as occasional and full-time RVers to save money. I recently had the opportunity to visit City of Rocks State Park, a park and campground I’d heard about from several bloggers in the past. It’s in between Silver City and Deming, New Mexico, and as we were staying in Deming, it was an easy drive of about a half hour to the park. I found it to be a small, but gorgeous, park, with a botanical garden, hiking and incredible large rock formations that you can camp next to, climb and photograph. During my visit, I lucked into watching a hawk feed its family. Absolutely an incredible sight. I was also pleasantly surprised to have a pretty excellent cell signal (3 bars on T-Mobile, good enough for high-quality streaming on my phone). 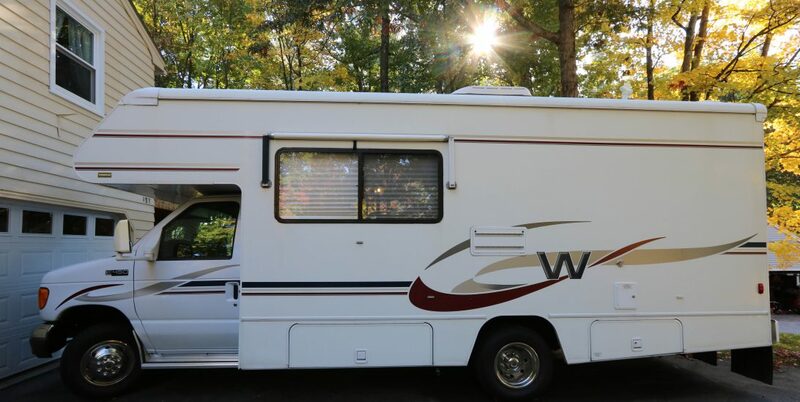 There are two campground areas – one area is with the rocks, boondocking, and the other area offers hookups. To be perfectly honest, I felt the area with hookups wasn’t too appealing. Sites are very close together and don’t have much privacy. But if you’re able to boondock for a few nights, I highly recommend it here. Due to the height of the rocks, the sites offer a ton of privacy and space, with incredible views and a truly unique experience camped among the rock formations. New Mexico’s state parks are an incredible and affordable resource. A day pass is only $5/car and will get you into multiple parks in a day, which is especially helpful in this area if you just want to drive through them or make quick visits. But an annual pass (day use) is only $40, making it extremely affordable. An annual pass for camping is also a steal, if you’ll be using it for say, three months, but if not, camping rates at the state parks are only $8-$14/night, so it’s definitely a great deal. I’m very thankful I finally had the chance to visit City of Rocks. It’s an other-worldly experience that I highly recommend. Next up for us: we are hard at work on our online ukulele course and are about to release a new album of ambient music for yoga and meditation. Lots of great stuff. Albuquerque, New Mexico is a wonderful city, full of art, great food, and convenient transportation options including an airport, train station and bus system. It’s well worth a visit by RV, but choosing where to go and what to do during your stay can be overwhelming. Here’s your guide to where to go and what to do in Albuquerque, New Mexico. I hope you enjoy it! Do you have a savings account? Do you have several savings accounts to organize the money for the roof that needs replacing vs. the money for your next vacation vs. the money for your car insurance vs. the money for your kid’s college fund? If you don’t have it already, you need Capital One 360. We live by these banks accounts, honestly. For many, many years as a freelancer, this has been my foolproof method for saving money for the inevitable big expenses that come up. Car insurance payments? On it. Money for our honeymoon? This is where it all went. They have their own checking account too, which works really well, but if you like your current bank or credit union, there’s no need to give up your existing checking account. Follow this link to receive $25 when you open a savings or checking account – or $100 if you’d like a money market account – and you can experience how easy this is! Create as many bank accounts as you need – I’ve had as many as 20 here – with titles like Vacation, Pet Fund, Future House etc., and then set up automatic withdrawals. If you get paid on Fridays, set up auto-withdrawals of small amounts when the paycheck hits. That’s how we save for RV repairs, birthday gifts and future Disney vacations. It’s fun to watch the money accrue, and it’s so easy! You’ll also find they have some of the highest interests rates around for savings accounts. I can rave about the ease of their savings accounts for days – open new ones in moments, name them whatever you want, set up easy automatic deposits from your main checking account, do it all online or on your phone – but you should really try it for yourself. Head here to sign up for free and earn a $25 bonus when you open a savings or checking account, or $100 if you open a money market account! We also get a few coins when you sign up, so it’s a win-win for everyone. Thanks for reading, and I hope you found this helpful! I just recommended it to several friends who found it to be a lifesaver as they work on their budget and savings goals. We’ve been studying the book You Need A Budget, and this will work perfectly with that book. (My other current favorite is You’re a Badass At Making Money if that’s more your style.) Have a wonderful week!